Steve Kaye is a licensed fishing guide and has worked full-time in the fishing and guiding industry since1994. Steve now owns and operates Streamside Adventures Professional Guided Fishing Services. He is known to friends and customers as a dedicated and productive angler. 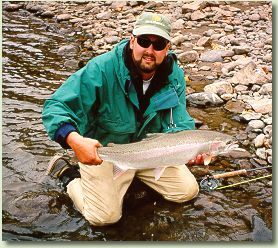 Some of Steve specialties include float fishing for Steelhead and Salmon, fly fishing for Salmon and Steelhead and fishing for Sturgeon. Steve has also been a regular guest on the T.V fishing show Sportfishing BC. When not guiding clients Steve can usually be found flying up some river in his jet boat with his favorite fishing partner his son Josh.